As we age, our body’s ability to produce collagen decreases and our faces begin to age and wrinkle. Since collagen keeps the skin youthful and smooth, increasing your collagen production will rejuvenate your facial appearance. 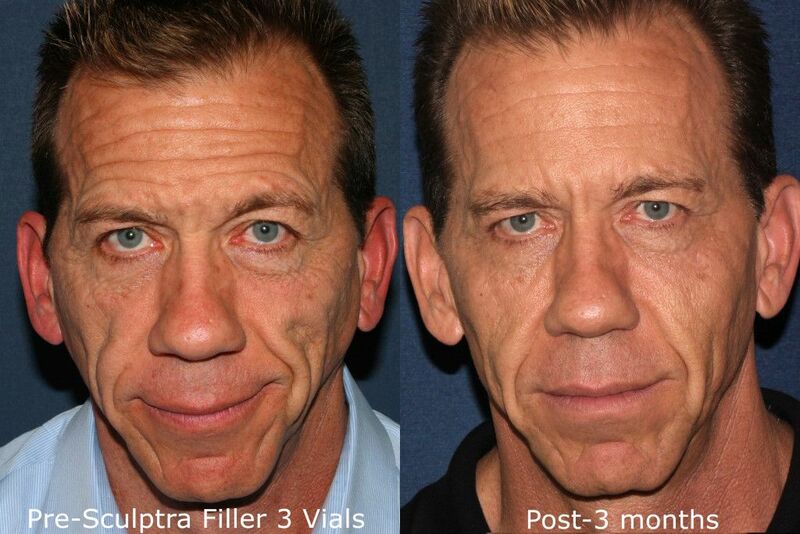 Sculptra is a collagen replacer and is used to replace the volume loss that occurs naturally due to the aging process. The loss of volume is one of the key components that make a face look older. Since a young face is full and voluminous, by restoring volume, the face will look younger. Our expert cosmetic dermatologists can correct shallow to deep wrinkles and folds by contouring the face and adding volume. Unlike other fillers, Sculptra works by stimulating the body to produce new collagen. By replacing lost collagen, it gradually gives you a more youthful looking appearance without making you look like you’ve had work done. Sculptra targets the underlying causes of the signs of aging. Within the deep dermis, your skin’s structure is reinforced as the poly-L-lactic acid in Sculptra stimulates the body to produce new collagen. This reinforced collagen structure provides a foundation that gradually restores the look of fullness to your shallow to deep facial wrinkles and folds that have been depleted over time. The result? Gradual and subtle corrections to these facial wrinkles. This can provide a refined, more youthful-looking appearance. Prior to injection, a local anesthetic is administered in order to decrease discomfort during the procedure. 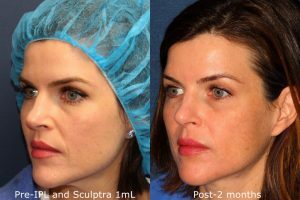 At Cosmetic Laser Dermatology in San Diego, our skincare specialists will inject Sculptra into the areas of your face that need to be volumized. In order to achieve natural results, a series of treatments (usually 3 sessions over a few months) are needed. After these treatments, the results gradually become visible and last for up to 2 years. Read our pre/post treatment guidelines for Sculptra. 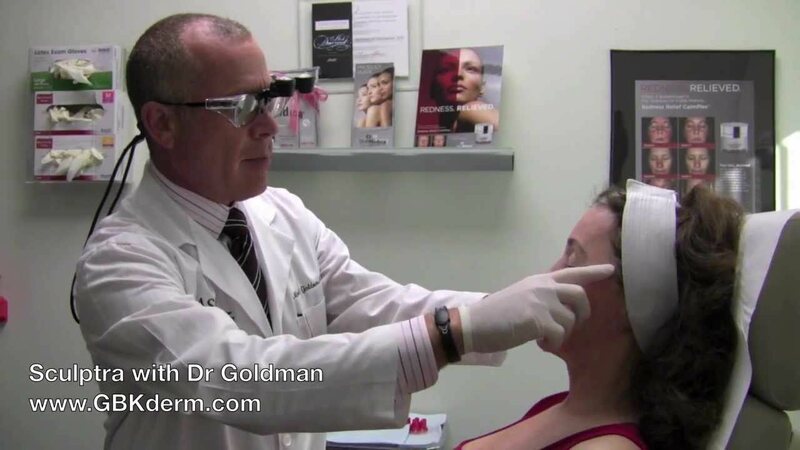 Cosmetic Laser Dermatology’s board-certified dermatologists are expert Sculptra injectors. We are one of the few dermatology centers whose doctors perform injectable treatments, not the nurses or assistants. To learn more, contact our dermatology center today! Q: What makes the face age? A: The face begins to age as we lose collagen and skin elasticity. Facial aging is caused by both internal factors (genetics and natural aging process) and external factors (sun damage, smoking, pollution, facial expressions, gravity, etc.). All of these factors contribute to color and texture issues, as well as loss of volume in the face. A: Since Sculptra provides a natural-looking appearance subtly over time, it is a great anti-aging treatment for those who do not want people to know they have had work done. Patients who want to restore facial volume, hollow eyes, sunken cheeks and/or thin lips are prime candidates. A: On average patients will need a series of 3 injection sessions spread out over a few months to achieve the best results. The effects of appear gradually, so it is important to slowly add product in order to maintain a natural facial appearance. Our doctors will assess your individual situation and desires and create a treatment plan that suits your personal needs. A: You will not see immediate results from Sculptra injections. Generally, patients begin seeing the effects within a month of treatment. Since the volume is not created by the product itself, but the product’s ability to stimulate your own collagen growth, it takes time for results to be visible. Within the next few months, the results will continue to improve, until your desired results are achieved. Keep in mind that immediately following the treatment you will experience some swelling, giving your face a more volumized appearance. However, within a few days this swelling will disappear and your face will look like it did prior to the treatment. Do not let this worry you and remember that the results appear gradually over time. A: The results can last up to 2 years. Some patients need periodic touch-up treatments to maintain the desired youthful effects. Q: What is Sculptra made of? A: It is a poly-L-lactic acid (PLLA), which is a biocompatible, biodegradable synthetic material that has been used by physicians for decades. A: Side effects are minimal. As with most injectable fillers there is a chance of temporary swelling, bruising, tenderness or redness around the injection site. If you experience any of these side effects they should subside on their own within a few days. Q: How much downtime should I expect? A: There is very little downtime after injection. While you may have some swelling, numbness or redness for a few hours following the treatment, you can continue on with your daily activities as soon as you feel comfortable with the way you look. You can apply makeup immediately after the treatment to cover up any redness, if necessary. Q: Do Sculptra injections hurt? A: To decrease discomfort, our doctors will apply a topical anesthetic before the treatment. Additionally, the product itself is mixed with a numbing agent to further minimize discomfort. Q: How much does Sculptra cost? 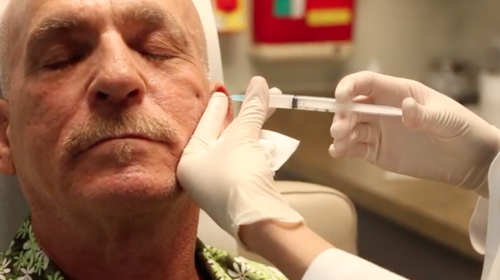 A: The cost depends on each patient’s unique situation and depends on how many injections and treatments are needed to achieve a youthful face. In general, Sculptra is more expensive than other filler options, but it lasts much longer and may end up being more cost-effective in the long run. Schedule a consultation with one of our physicians to learn more about how much treatments will cost. Q: Can Sculptra be used with other fillers and/or Botox/Dysport? A: Yes, it can be combined with other fillers (like Juvederm, Radiesse or Restylane) or Botox/Dysport. Since each product has a slightly different use, by combining facial injectables you are able to achieve even greater anti-aging results. These injectables can be used together in a liquid facelift procedure. Q: How often would a person be required for additional Sculptra injections to maintain their results? A: Sculptra is a collagen stimulator that keeps you looking lifted and refreshed for up to two-and-a-half years with a series of treatments. However, I usually suggest a top-off at the year mark to maintain your look. After age 30, we lose one tablespoon of fat from the face per year, so volume loss adds up. Please find a board-certified dermatologist who’s an expert at rejuvenating and sculpting the face with Sculptra. Q: Can Sculptra help fix my tired-looking appearance? A: You could get a nice rejuvenation of your under-eye area with a thin filler, such as Volbella, delivered via cannulas to reduce bruising and create a more uniform look. Though you didn’t provide full-face photos, usually adding Voluma or Sculptra to the cheekbones or midface can further rejuvenate the eyes by lifting the under-eye skin slightly. The filler in your midface will give you a much younger look overall. Consulting with a board-certified dermatologist will help you decide what to do. Q: Is Sculptra for temples safe? Is it a fairly straightforward procedure? A: Sculptra does a wonderful job of filling out lost volume in the temples. It’s a collagen stimulator, so it will stimulate your body to produce more of your own, strengthening collagen and elastin. The results can last for up to two years, though you may want to touch up at the year to year-and-a-half mark. It’s a fairly straightforward procedure, as long as the physician knows the anatomy well to avoid blood vessels and place the product strategically in the temple for the best result. Proper dilutions and quantities are important with Sculptra and your physician should be experienced in its use. Usually 2-3 sessions are needed to build the look slowly. Please find a board-certified dermatologist to administer your Sculptra. The temples are not an area you want to trust to an amateur. 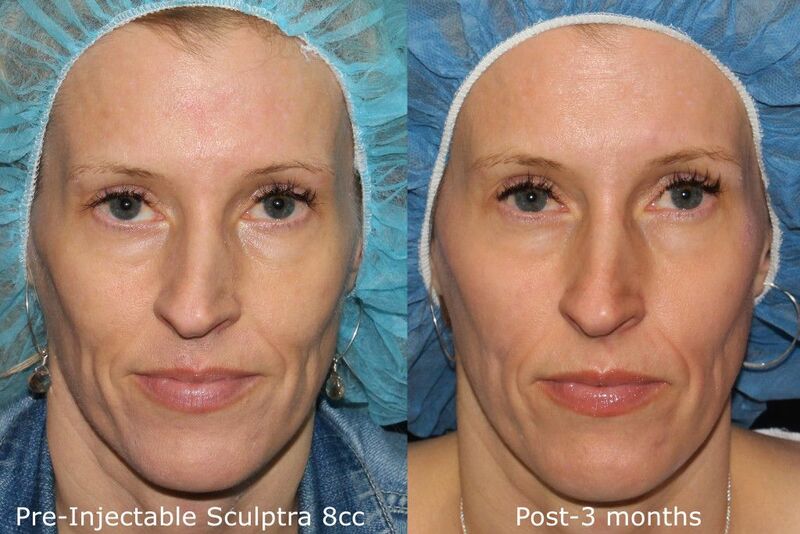 Q: How long will it take to see good noticeable results with Sculptra? A: Sculptra is a collagen stimulator, which means it actually works by having your body produce new collagen to take the place of the injected Sculptra microspheres (which dissolve). This takes time — usually at least two months. Also, we generally administer Sculptra as a treatment series — layering it on bit by bit — for the best and most natural-looking results. Please find a board-certified dermatologist to administer your next Sculptra treatment. A: Sculptra is a collagen-stimulator, so it takes your body about 2-3 months to produce enough new collagen for you to really start seeing results. Q: I have had many different types of fillers but they dissolve very quickly. Will Sculptra work better for me? A: Although you may metablolize fillers more quickly than other people do, Sculptra is a long-lasting filler that works by stimulating collagen. It’s meant to “dissolve” — and be replaced by your own body’s newer, stronger collagen. Sculptra’s benefits last for up to two years or more and can be enhanced with annual touch-ups. You’ll probably need two to three treatments. Be sure to consult a board-certified dermatologist who has expertise in using Sculptra to rejuvenate the face. Q: Does Sculptra cause scar tissue? A: Sculptra uses small micro-particles to stimulate the body’s wound-repair cascade. The collagen strands that are produced in this process are orderly, long, strong, and flexible — unlike scar tissue, which tends to be clustered, disorderly and stiff. Sculptra and other collagen stimulators produce collagen that improves the quality of your skin, making it stronger and more resilient. It not only looks younger, it acts younger. Please find a board-certified dermatologist to administer Sculptra for the most beautiful results. Q: I just got Sculptra yesterday. Why does my face look larger? A: Sculptra is a wonderful product that can restore lost volume to the face and fill in contour defects, including nasolabial folds. Sculptra is a watery solution that contains microparticles of poly-L-lactic acid (PLLA). 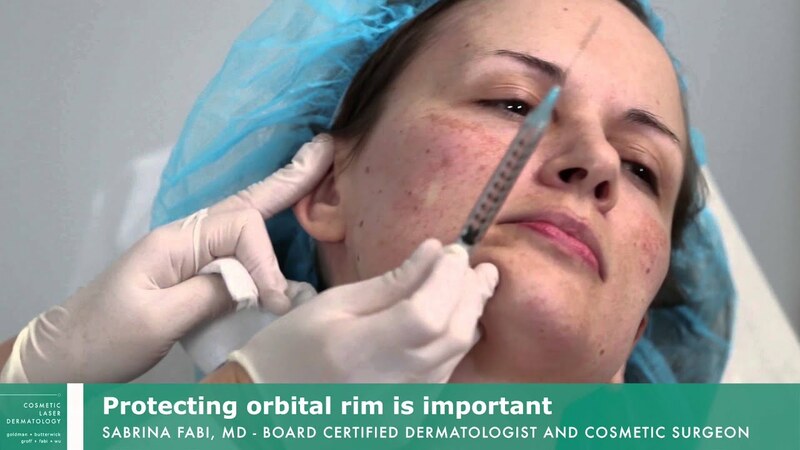 When it is first injected into the skin, the solution and the PLLA fill in the defects and lost volume. The liquid causes some swelling — which is undoubtedly what you are seeing now. The water will be absorbed in the next few days, reducing the volume greatly. At the next stage, some of the PLLA molecules will be resorbed by your body and you may think that you are going back to baseline (your look before treatment). This is not the case. As the PLLA molecules are resorbed, they are replaced by new, long, strong strands of collagen that firm up and support your skin, thus filling in the defects and lost volume again — this time more permanently (up to 2 years or more). The new collagen also allows increased production of elastin, which improves skin flexibility. Let this entire process play out before judging your results. Usually 2 or 3 treatments one month apart and results are gradual. If you only had one vial, I sincerely believe you will not look over-treated. If you are not thrilled with how you look in the next month or so, please contact the board-certified dermatologist who treated you. I suspect, though, that you will be very happy and will not have to make that call! 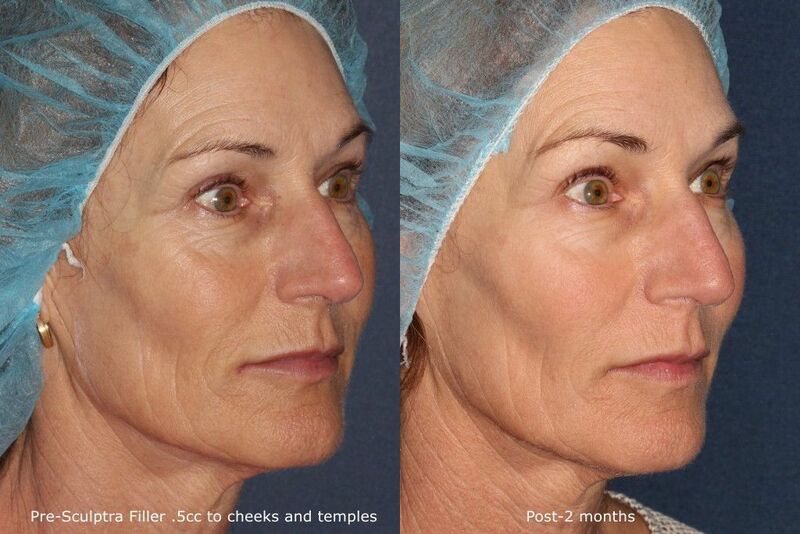 Q: How long is too long between Sculptra procedures? A: The dermal filler and collagen stimulator Sculptra lasts for about 2 years. Therefore, you will not be “starting over” if you get your second treatment six months later. Your Sculptra is still there, and has begun to stimulate your skin to produce new, strong strands of collagen. You can go ahead and begin layering treatments over that base layer. 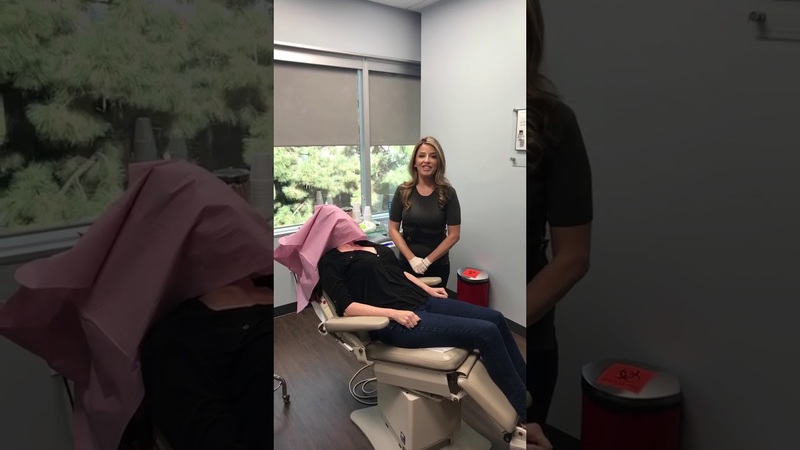 Although the first layer will start to be metabolized sooner than subsequent layers, we can compensate for that with yearly maintenance Sculptra treatments. First though, complete your series until you achieve the desired result. Please find a board-certified dermatologist to finish your Sculptra treatments to get the most beautiful and uniform remodeling. Q: Can Sculptra be used to augment actual bone structure? A: Sculptra is a versatile dermal filler that is also a collagen stimulator. It is thick and viscous, making it a perfect filler to create nonsurgical augmentations, such as chins, jawlines, and cheekbones. Consulting with a board-certified dermatologist who is an expert in re-contouring the face with Sculptra will get you optimal results. While Sculptra is a great collagen replacer, dermal fillers and a liquid facelift treatment are wonderful options for patients looking to restore lost facial volume. Please contact Cosmetic Laser Dermatology to schedule a consultation, during which we can determine the ideal rejuvenation treatment for you! Sculptra: Buy 3 vials get the 4th FREE!